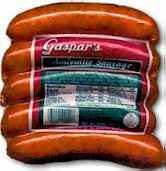 Home Other Meats: Chorizos, Andouille, Salpicao and Kielbasa Gaspar's Andouille 1 Lb. This is the spicy cajun sausage you have seen Emeril use so many times! It is traditionally used in jumbalaya and Gumbo. It is also excellent in Chili, with Eggs, Baked Beans, in Omelets, Soups, Hor d'oeuvres, etc. Ingredients: Pork, Salt, Vinegar, Spices, Water, Honey Mustard Seasoning(Dextrose, Dried Honey and Mustard (Honey, Maltodextrin Vinegar, Mustard Seed, Salt, Modified Food Starch, and Turmeric), Ground Mustard, Sugar, Onion Powder, Salt), Paprika, Potato Starch, Sugar, Garlic, Sodium Nitrate.